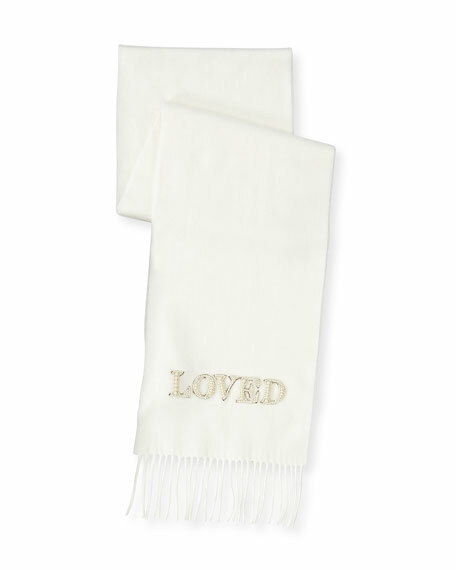 Gucci "Shaloved" scarf in silk cashmere with "Loved" applique. Gucci silk twill scarf in dégradé flower pattern. Lightweight, seasonless fabric. May be styled multiple ways. Finished edges. Made in Italy. Model's measurements: Height 5'10"/177cm, bust 33"/84cm, waist 25.6"/65.2cm, hips 35.8"/91cm, dress size US 2-4/FR 34-36. Gucci twill scarf with rainbow logo and city prints. Lightweight, seasonless fabric. May be styled multiple ways. Solid border. Silk. Gucci twill scarf with rainbow logo and city prints. Lightweight, seasonless fabric. May be styled multiple ways. Solid border. Silk. Made in Italy. Model's measurements: Height 5'10"/177cm, bust 33"/84cm, waist 25.6"/65.2cm, hips 35.8"/91cm, dress size US 2-4/FR 34-36.